LAKEVILLE, Connecticut – May 27, 2014 – Both of Doran Racing’s Nissans finished the Continental Tire SportsCar Challenge (CTSCC) Grand Sport race at Lime Rock Park on Saturday, but neither finished as high up on the scoreboard as the team had hoped. Both cars rolled back into the transporter in one piece, however, and the team will take the points it earned in the Berkshires and look forward to the next event at Kansas Speedway June 7. The team’s #14 Nissan NISMO 370Z RC driven by Brad Jaeger of Charlottesville, Va., and B.J. Zacharias of Cincinnati started seventh and finished 11th, one lap down, in Saturday’s Northeast Grand Prix. The #41 Tower Events Nissan 370Z co-driven by John Farano and David Empringham of Toronto started 12th and finished 18th, three laps down, in the 28-car field. The starting grid was determined by points after qualifications were rained out. 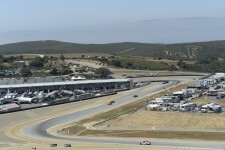 The weather wasn’t a factor in Saturday’s race, although it did start to rain towards the end of the 2-hour-and-30-minute race on the narrow, 1.5-mile, seven-turn road course. Jaeger and Farano were the starting drivers in their respective cars, with Zacharias and Empringham taking over around the halfway point in what turned out to be a 148-lap event. There was only one full-course caution, which was displayed from laps 87 through 92 for a Camaro that went off course. Jaeger kept the #14 in sixth or seventh place while he was behind the wheel. Unfortunately around the 30-lap mark a Suburu made contact with the Nissan’s right front, compromising its alignment. Jaeger did the best he could on the twisty track after that, and the car was still in seventh place when he pitted for fuel, tires and the driver change around lap 60. Zacharias started his stint in 12th place but he had the car back in the top 10 by lap 70, and it was eighth when there was finally a break in the action for the full-course caution on lap 87. He made another pit stop right before the restart to push him back to tenth. He was still in tenth place with 30 minutes remaining but he was also still one lap down. Mark Wilkins’ Aston Martin passed him with 22 minutes remaining to drop him to 11th, and with no other restarts to tighten the field the car finished in that position. Farano kept his Tower Events Nissan in 12th place for the first five laps but then dropped to 15th and later 16th. He advanced to 14th by lap 39 and was holding his own nicely, running between Ray Mason’s Subaru and Anthony Mantella, who was in the Aston Martin that Wilkins would drive later. He was still in 14th place when he pitted around lap 53 and Empringham took over. Empringham was able to get the car into tenth place by the time the full-course caution occurred. He had to pit two more times, one being for a penalty, and the car dropped to 18th place, three laps down. With no other yellows the field remained strung out, and he took the checkered in that position. 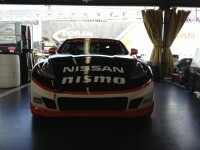 For more information on Doran Racing, see DoranRacing.com. The team also has a Facebook page. 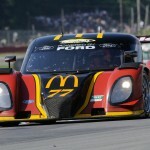 The series’ Web site is part of imsa.com. Brad Jaeger: “The #77 Suburu hit the right-front corner of our car about 30 laps into it, but we did what we could with what we had after that. The contact definitely hurt our effort though. B.J. Zacharias: “The race just did not go our way today for one reason or another. “Brad had a great opening stint, running inside the top 10. Towards the end of his stint he was hit in the right front pretty hard by one of the Subarus, and it knocked the toe out a bit. “We pitted for fuel, tires and the driver change but came out with the leaders. While we could run right with them, we weren’t able to get around them. This put us a lap down and we just had to keep digging. “Kevin and the entire team did a great job and gave us a good car. It just wasn’t our day. David Empringham: ” I got a penalty for leaving the pits when the red light was on.